Being a part of the Indian mutual industry for over 25 years, you have been witnessed its stupendous growth. Tell us about this journey. It has been very interesting. We had to make a constant effort in creating the category of mutual funds among investors. We tried to make investors realise the importance of mutual funds. The 2008 bull market brought some awareness on investing in mutual funds. One change happened between the 2007 bull market and 2008 and the 2009 crash and that is when the time the shift was happening. The number of people keen in putting money in the market were higher than the number of people who wanted to redeem. That was the first time the name of mutual funds got established. The last six-seven years have been interesting when the rate of growth in mutual funds has been much higher than any other sector in the industry. It was five-six times the GDP growth and almost two-three times higher than the banking lending growth and the banks’ savings rate. Now, we are contributing about 20 per cent of the banking industry size. When you started, this awareness was very little. What did you have to do to change this? The number of players were less in the beginning and players like us could establish because of our brand. We had to communicate to investors about the need of mutual fund investments from the investors’ perspective. In the early years, building size was difficult but establishing a track record on the basis of investment management capability, processes, management processes, managing risk, they were actually more important. Since the Mutual Fund Sahi Hai campaign started, the awareness has gone deeper. What did mutual funds deliver to the people that made it different from other asset classes? First was transparency of investment. Certain amount of trust was brought on the table. This was one industry that has gone through all the cycles and yet has given fantastic returns. And the returns have been coming from 15 to almost 22 per cent. No other asset gives this much return. And finally is the convenience of transacting and investing your money is much easier in mutual funds while maintaining the expectation of returns at a higher level. At every point, risk was getting mitigated. But all this risk in relation to the portfolio is very small in size. The impact is also the least. The asset under management (AUM) of the mutual fund industry has grown to around `23 trillion in October this year. What has caused this growth? The increased recognition the mutual fund industry is getting among the investing public is key. Also the savings rate would be growing by about 14 per cent and the next round of growth for MF mutual fund industry may be faster than what you have seen in the last 10-20 years. Second, compared to all alternate investment and asset classes, mutual funds seem to be the best option for the savers. You were part of the Mutual Fund Advisory Council in 2012 and gave valuable inputs leading to decisions like incentivising fund houses to go beyond the Top 15 cities. What was your vision at that time? The agenda was on how to take the industry to the next level. Year 2009, 2011 and 2012 were bad movers, which came after good years of 2007 and 2008. The three-year dull period made us think on what needed to be done for which Sebi had set up a committee. It thought about various things to help the industry grow. Taking mutual funds beyond the top 15 cities was a path-breaking move. What drove that plan was that despite this being a three-decade old industry, the concentration of flows from big cities was very high whereas monies were available everywhere. We thought of how to incentivise people in the hinterland to participate in the mutual funds. So Sebi coined this new term T15 and B15 for Top 15 cities and Below Top 15 and that was the market we targeted. 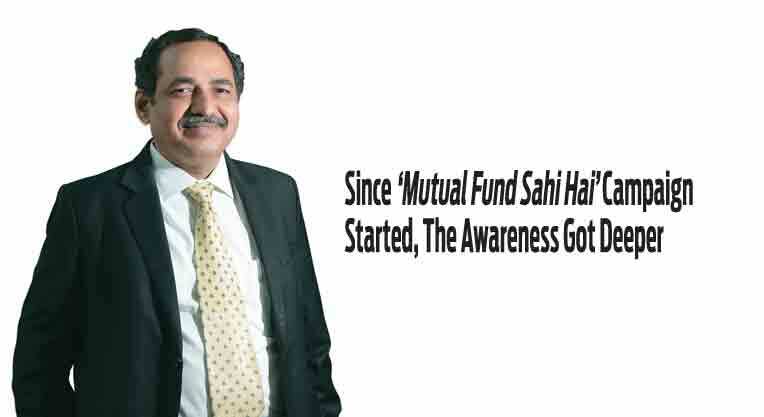 The Mutual Fund Sahi Hai campaign brought MFs to the masses. What was the idea behind it? When I took charge as AMFI chairman in 2016, investor education was one of my responsibilities and we sat and discussed how to expand its scope. We had to change the top of mind recall from risks of MFs to its returns. In October the market was pretty volatile, but SIP inflows were at an all time high. What caused this? Partly it is the maturity level of distributors, AMCs and investors to consider investment in SIPs as an ongoing thing rather than one off investment. Second is the awareness created by the Mutual Fund Sahi Hai campaign and the investor awareness programmes. Also, today the volatile markets is being seen as an opportunity. One significant development has been the re-classification of mutual funds. How will that impact investment? It is a one-time exercise for a long-term benefit for all. It now creates boundaries and all money managers have to operate within the boundaries of mid, large and multi cap, high and low duration funds. Earlier this was not defined. Also, names of mutual funds mean nothing but the purpose of the investments needed to be clearly defined which has come now. What did demonetisation do to investments? Demonetisation should be credited for mutual fund industry growth. Though it created some unpleasant experiences for a few months, it eventually helped savers to find the roots of their savings into various asset classes. Under your leadership, your company has grown five-fold in terms of AUM. What has been your vision? We take pride in that because we are a non bank-backed mutual fund. Our aim is to be a leader and in the top three in terms of customer base, profit, and branch and network expansions. We have nine focus areas for the company for the next 10 years. Sebi has intervened in the market from time to time. Have there been too many interventions and has that hampered the work of the industry? There is no doubt that there have been frequent interventions, but they have been necessitated by the discussions it had with the industry. It is an accumulation of all the ideas that have come up in the last few years and an aggressive movement by Sebi on them. What is the major challenge for the industry?